AMD has released a number of X models, but this time, let’s take a look at another processor from them. Today, we’re going to focus on their non-X product which is the Ryzen 7 2700 – an eight-core processor which is much cheaper compared to the 2700X type. The 7 2700 also frees itself from the 105-W TDP since it works on just a 65-Watt TDP. 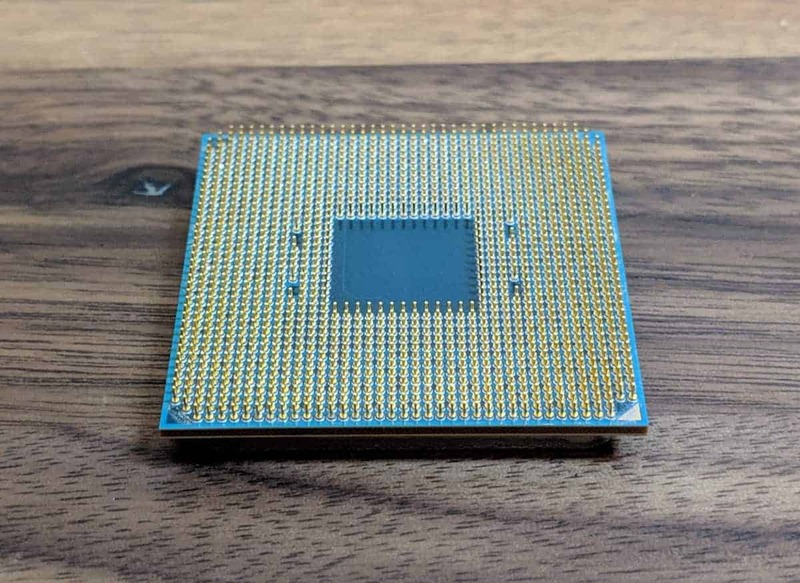 Its essence and hardware are the same; however, the Ryzen 7 2700 is substantially clocked lower, and if you’re comparing it with the other X models, you’ll see that these have better clock frequencies and are binned better. Thing is, if you’re willing to do a bit of tweaking here and there, you can save a ton and get the same performance with this. The Ryzen 7 2700 features a total of 8 cores and 16 threads that cost a good price. But despite these interesting features and promising claims of AMD, is this Ryzen 7 2700 the better option for proper gaming or threading? Let’s check it out. AMD Ryzen 7 2700 Review – What’s in the Box? The Ryzen 7 2700 has the same packaging as the 2700X, which is similar to that of the 1st generation Ryzen box. 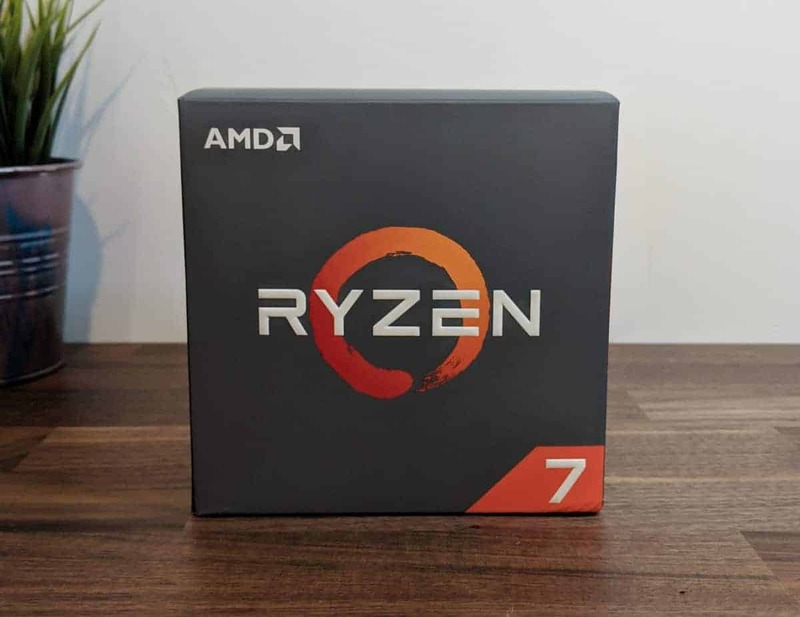 In front, you will find the Ryzen logo in the middle of the package, while the bottom right of it features a ‘’7’’ which means that the processor is part of the Ryzen 7 family. 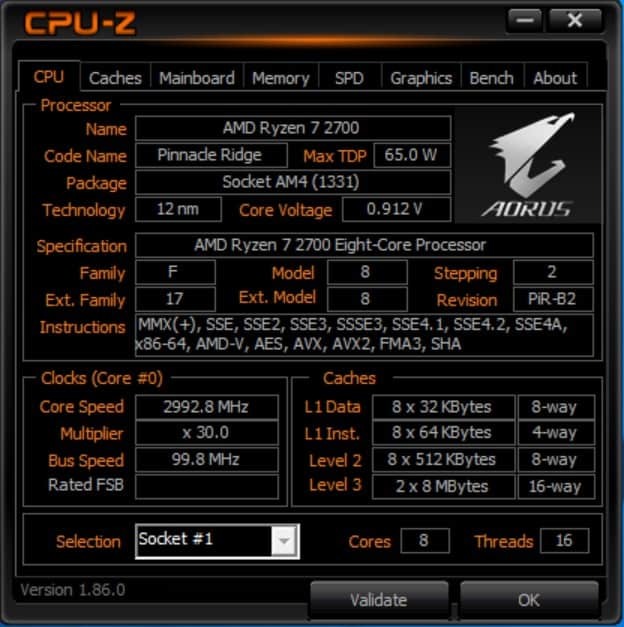 On one side of the box, you will find an image of the Wraith Spire CPU cooler that is included within the Ryzen 7 2700 package, while the other portion features a see-through panel that allows you to see the processor. When you start getting the items out of the package, you’ll find two additional boxes inside. One holds the CPU with the case badge, and the other holds the Wraith Spire Cooler. The Ryzen 7 2700 is featured with the Wraith Spire Cooler which has an RGB LED ring that can be found around the fan. At the center of this Ryzen processor, you will find the new 12-nm Pinnacle Ridge silicon that also comes from AMD. The chip is based on the brand new Zen + microarchitecture wherein the + stands for refinement instead of a big architectural change. The company is also announcing the brand new interconnect that they called the AMD Infinity Fabric. It is the newer and faster way to link numerous parts in an SoC. This is also not just utilized for the Ryzen processors, but can also be utilized for future AMD GPUs, as well as other AMD chips that will be created in the near future. This Infinity Fabric provides you with a better, secure, and faster connections in a chip. The intra and inter-chip connector is standardized and utilized in a lot of products from AMD. With that, the company will be able to conveniently communicate over the same interconnect. The Ryzen 7 2700 features 20MB of cache; it also has 8 cores, 16 threads, plus a 3.2GHz base that has a 4.1Ghz boost. This is a much lower boost compared to the 2700X while its base is also lower at 500MHz. Since the processor is made for increased multiprocessing performance for both creators and gamers, this Ryzen 7 2700 processor from AMD comes with a max turbo frequency which is 4.1GHz and a clock speed of 3.2GHz. Because it is also part of the Ryzen processors’ 2nd generation, it comes with 16MB of L3 cached memory. Since the process has a total of eight cores, it is able to run numerous programs at the same time without decreasing the speed of the system. For the sixteen threads, it allows for a basic yet orderly sequence of instructions to processed or passed through via one CPU core. The Ryzen 7 2700 comes with a TDP of 65 Watts while also supporting the XFR 2 or Extended Frequency Range 2, AVX 2.0 extensions, dual-channel DDR-4 memory, AMD Sense MI technology, 14nm semiconductor technology, AMD virtualization, and FMA3. Graphically, this processor does not feature any built-in graphics which only means that you will need to buy a dedicated graphics card of your choice. It’s also great that the processor is unlocked so you can easily overclock past the max turbo frequency. The CPU also comes with the Wraith Spire Cooler with a cool RGB LED brightness that is protected by a three-year limited warranty. The company has just released a brand new chipset together with their latest motherboards. This is the X-470 chipset that provides an improved throughput on the USB bus, memory layout, support or overclocking for increased frequencies, decreased latency, as well as enhanced CPU power delivery plus reduced IDLE power consumption. The chipset adds USB ports while the processor also provides 4 native USB 3.1 ports. Support for the RAID 0 / 1 / 10 setups for both SATA and NVME are available, as well as overclocking assistance on the X-470 chipset. The Precision Boost Overdrive is a feature that was just hinted during the launching of the 2nd Gen Ryzen 7 processors. And now that the Threadripper has been launched, AMD decided to explain this overclocking feature in a more detailed manner. Classic overclocking that is BIOS-based efficiently transfers the goal posts to provide the processor additional room to boost and develop. The Precision Boost Overdrive works just the same way; the only difference is that it is completely automated. This demands a motherboard with a powerful VRM, and it requires a CPU cooler that is better than stock, just like the classic way of overclocking. Just remember that this can void your warranty, but if it is something that you aren’t really concerned about, then you can easily enable the Precision Boost Overdrive feature within the BIOS of some X-470 motherboards, or through a switch in the Ryzen Master overclock utility. AMD puts together the Wraith Spire LED cooler together with the 2nd Generation Ryzen 7 2700. It features outstanding thermal performance and color managed illumination. The company’s mainstream and future proof computing platform has been upgraded with the brand new B450 and X470 chipsets. The AM4 socket represents AMD’s platform that aims for the fastest PCIe 3.0, DDR4 memory, as well as NVMe technologies that are available. These also include the pioneering native USB 3.1 Gen 2 support on a chipset. We all know that SSDs are fast, efficient, and useful; the thing is, they’re really pricey and provides a limited capacity. As for hard drives, these show off their huge capacity at a low price, yet they’re obviously slower than SSDs. It’s a really good thing that AMD combined these two storages under the Store MI Technology, specifically a single drive where it automatically transfers data that you usually access on your SSD. Technically, you get the responsiveness of an SSD and the capacity of a mechanical hard disk at a conveniently low price. The Store MI from AMD is a highly powerful technology that is perfect for you and other computer enthusiasts. This is because it allows you to enhance boot time, load time, system responsiveness, and file management. Each processor of AMD Ryzen has been multiplier-unlocked from the factory. With that, you’ll be able to personalize the device’s performance based on your preferences. The company lets you take advantage of the Master utility which now features the Dynamic Local Mode – a new feature that’s specific for the AMD Ryzen and other processors from AMD. The Sense MI technology from AMD is a collection of adapting and learning features that aid the Ryzen processors in customizing its performance based on your applications and preferences. The Zen core is considered as a clean sheet X-86 design that influenced a generation of high-performing AMD products from 2017 onwards. The Zen mixes the high throughput and decreased power design procedures to establish a versatile and balanced architecture for your laptop, supercomputer, data center, and laptop. Now for the second generation of Ryzen processors, Zen had been upgraded to the Zen + which is a desktop processor located on the advanced 12-nm process node which provides boosted instructions per clock performance. With the improvements of the Zen core, enterprise productivity, cloud computing, gaming, immersive visual experience, as well as data security can be met. This is possible because of the powerful multithreading capabilities, large caches, and high-performing execution engine. The Zen cores are created to adequately utilize the available microarchitectural resources for better computing performance. Unlike the previous architecture from AMD, the pre-fetch algorithms and 3-tier cache system allow increased throughput in the execution and cache engines. A real artificial intelligence that is inside each AMD Ryzen processor makes use of an artificial neural network to better fathom applications while assuming the next steps of how your workflow will be in real time. These so-called skills of prediction can increase performance by leading your games and applications down to the most efficient and useful path within the processor. This feature has a complex grid of smart sensors that manages the CPU temperature, power draw, and resource usage that provides a quiet and cool operation to the Ryzen 7 2700 processor. It also brings smart optimization circuits and low power needs of an advanced 14-nm Fin FET manufacturing technology. Refined learning algorithms can better understand the workings of your apps. This feature also simultaneously anticipates the data that may be required. The Smart Pre-Fetch feature predicts and brings the said data to the Ryzen 7 2700 processor for quicker and more responsive computing. The AMD Ryzen 7 2700 does not only present a cost-efficient price for gamers who are budget-conscious, but it is also great for enthusiasts and overclockers who do not have enough cash to purchase flagship parts. The improvements and developments in manufacturing the processor can be seen in its decreased heat and power. Also, AMD was able to improve the processor’s performance compared to the much earlier generations. With the AMD Ryzen 7 2700, we have seen a lot of improvements such as important elements like reduced heat and power consumption. This means that AMD was able to enhance its processor’s performance compared to the first generation. What we liked was the Store MI feature since this automatically links your commonly used files with the fastest storage to provide excellent performance. There is even an AMD Store MI software that you can download for free if you have an AMD 400-series chipset. If you’re in need of a budget friendly CPU that will work excellently for rendering and video editing, then the Ryzen 7 2700 is the ideal choice. Another advantage of the 2700 is that it comes with stock coolers unlike a lot of Intel’s K-SKUs and other processors. The coolers were also effective for mild overclocking. We also liked the RGB LED ring around the cooling fan since it makes for a great touch for one’s gaming rig. AMD has proven that the Zen architecture offers a lot through this second-generation processor from the Ryzen 7 series. With the Ryzen 7 2700, we have seen that the Zen layout can really offer data security while simultaneously improving productivity and enhancing our gaming experience. The 2700 is a great choice for a low TDP processor if you plan to use this for a small server or an all-day PC. Despite the low price, the Ryzen 7 2700 gives you more than what you pay for which is why we highly recommend that you consider this processor. You can get yourself a Ryzen 7 2700 for around $419AUD. For more information head on over to the official AMD product page.